These UI tweaks are nice, but they’re all kind of incremental. The biggest difference here is that Clear now supports the iPad, and the app really shines when it comes to using this new expanse. 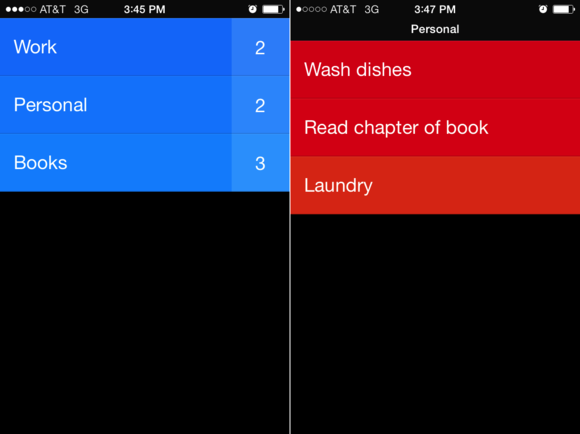 Instead of showing you only a single list of lists or tasks, as the older iPhone-only version did, on an iPad the new Clear splits the main view into two columns: On the left is your master list of lists (containing, for example, lists for personal, work, and home); on the right is the list of tasks for whichever list you select. On the iPad, Clear now shows both your lists and the current list's items simultaneously. 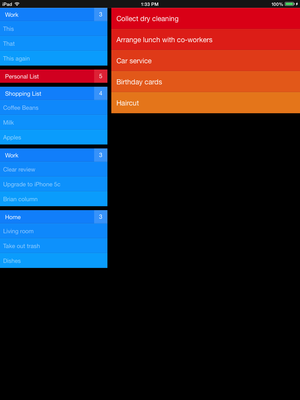 This larger view helps you stay organized and gives you more context when viewing a list. (On the iPhone, Clear still displays only a single column—your lists or a list’s contents—at a time, thanks to space limitations.) There’s even an option to show each list’s tasks below the list name. As before, gestures are central to using Clear. A tutorial on the first launch of the app teaches you how to add tasks, how to delete them or cross them off as finished, and how to change their priority, all using a series of swipes, pinches, pulls, taps, and so on. On an iPad, Clear adds even more of these tricks: For example, whereas tapping-and-holding on a task in the original version of Clear (and in the new version on an iPhone) lets you move the task up or down within the current list, on the iPad you can use the same gesture to move an item to a different list—just drag the task onto another list on the left. Tapping two fingers in any unused area of the iPad view gives you the option to email the current list. (Recipients can view the list in plain text within the body of the email, or add the list to Clear on their own iOS device—or, if they have the Mac version of Clear, on their Mac.) And while you access the iPhone version’s settings by pinching your fingers together until you get to the “top” level, on the iPad you simply swipe two fingers to the right from anywhere in the app. However, in my testing, the app didn’t always respond to two-finger gestures, requiring several attempts before responding correctly. Thanks to the smaller screen, Clear on an iPhone still shows either your list of lists (left) or the selected list's contents (right), but it’s now a better match for iOS 7. Clear was a good list-making app from the start, and it’s continued to get better since its unveiling. Clear for iOS 7 is a major upgrade that looks fantastic and offers much more functionality, though it’s not quite great yet. The small navigation problems, while minor, are a hindrance to perfection, and Clear still doesn’t allow you to configure task reminders (though the app’s developers say that feature is on the way). But Clear remains elegant and is now even more useful. 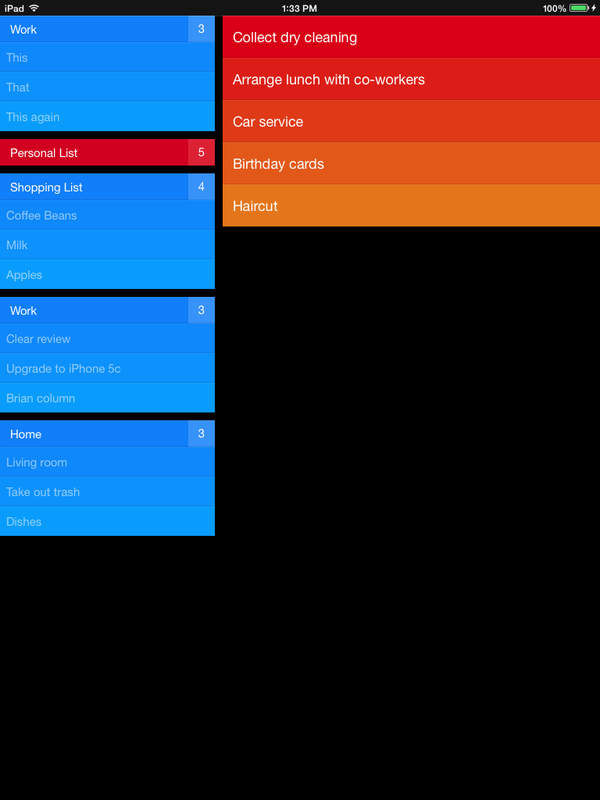 It’s an appealing way to get organized—whether you’re on the iPhone or iPad—and to stay on task. The original version of Clear was a good list-making app, and thanks to some nice features and iPad support, the latest version (a separate, paid app) is considerably better.